When it comes to finding a great deal on a shipping container in Kansas City, XRefer is the top choice. Whether you are looking for just a short-term, one month shipping container rental in Kansas City or you are looking to buy a few 40 ft shipping containers in Kansas City for your construction company, XRefer consistently offers the lowest prices and has the best selection to choose from. When you use XRefer to find a shipping container in Kansas City you know that you will get excellent customer service, the lowest prices, and you will get the right unit for your needs. All of our partners in Kansas City have been reviewed and have an excellent history of customer satisfaction and are committed to providing our customers with the best possible experience. How much does a new shipping container cost in Kansas City? Prices for purchasing a new shipping container in Kansas City range from $3,000 to $5,000 depending on the sizes and features that you want. Larger containers are more expensive and you will pay a premium for features such as refrigeration. How much does it cost to rent a shipping container in Kansas City? Rentals are an affordable, flexible option. Kansas City shipping container rentals start around $85 a month for 10 ft units and go up to $225 for larger units with additional features. Can I buy a used shipping container in Kansas City? Yes, purchasing a used shipping container in Kansas City is a great way to save hundreds and often times even thousands of dollars. 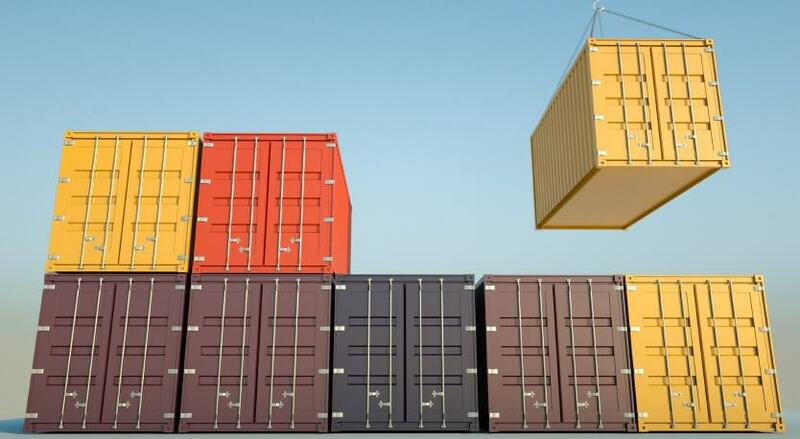 When buying a pre-owned shipping container it's important to choose a reliable supplier as well as inspect the container to ensure that it's in good condition. Containers are made with high quality steel and often come with advanced locking systems, making them extremely secure. A main advantage of getting a shipping container in Kansas City is that they are designed to keep your things safe and secure while being kept outdoors. Where can I keep a shipping container in Kansas City? Kansas City shipping containers can be kept anywhere there is a relatively flat and firm surface. They are often kept on grass, dirt, gravel, and concrete surfaces in parks, backyards and parking lots. Ready to compare prices on a shipping container in Kansas City, Missouri? Give one of the pre-screened companies serving Kansas City a call right now or use XRefer's quote compare tool to get pricing from a few of the top Kansas City shipping container companies right now. You won't get better rates anywhere else! There's a high demand for Kansas City shipping containers. Call or request a quote right now! Serving: Bannister Ares, Fairlane, Little Blue Valley, Sunset Hill and throughout Kansas City. Serving: Country Club Plaza, Country Lane Estates, Crown Center, Sunset Hill West, West Blue Township, White Oak and throughout Kansas City. Serving: Blue Valley Industrial, Citadel, Morningside, Royal Oaks, South India Mound, Waldo Homes and throughout Kansas City. Serving: Central Blue Valley-Park Tower Grade, Coleman Highlands, Legacy East, Roanoke, Wendell Phillips, West Blue Valley and throughout Kansas City. Serving: East Community Team North, East Sqope Highlands, Foxtown East, Little Blue Valley, Oak Meyer Gardens, Waldo Homes and throughout Kansas City. Serving: Fairwood And Robandee, Ivanhoe Southeast, Morningside, West Blue Township, West Blue Valley and throughout Kansas City. Serving: Central Business District-Downtown, Lewis Heights, Pendleton Heights, Santa Fe Hills, Westwood and throughout Kansas City. Serving: Central Business District-Downtown, Crown Center, Legacy East, Romanelli West, Sarritt Point and throughout Kansas City. Serving: Beacon Hills, East Meyer, Greenway Fields, Key Coalition, Oak Park Southwest and throughout Kansas City. Serving: Armour Hills, Brown Estates, Eastern 49-63, Foxtown East, Roanoke, South Blue Valley and throughout Kansas City.